Nowadays, sweating in a sauna, hammam, or spa commodity is usually seen as an appropriate or even trendy way of promoting our personal well-being and social interaction (Gross et al., PLoS One 9(3):e92412, 2014). However, in everyday life, excessive sweating is associated with lacking hygiene, poor grooming, or emotional discomfort. 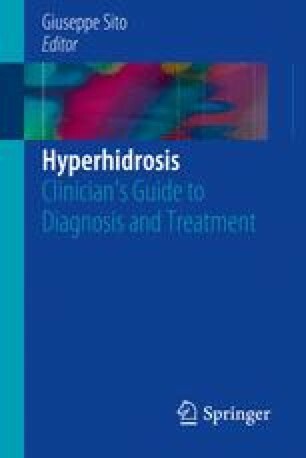 Furthermore, hyperhidrosis is often classified as a “high-impact social no-go” and can be accompanied by psychological distress, social self-imposed withdrawal or isolation, and significantly decreased quality of life (Kopelman et al., J Vasc Surg 24(2):194–199, 1996; Weber et al., Br J Dermatol 152(2):342–345, 2005; Gross et al., PLoS One 9(3):e92412, 2014). So far, cause and consequence of sweating, stress, and psychopathological symptoms are still unclear due to their reciprocal interaction.